Be sure to check out my Happy Eats Healthy site to see upcoming classes, seminars, for more information on Health Coaching, nutrition information and more! Quinoa-lentil-balls. Doesn't exactly roll off the tongue, does it? But these little babies are packed with nutrition and flavor! Both the quinoa and the lentils are loaded with protein, essential amino acids and vitamins; these aren't just veggie meat balls, they are super balls! 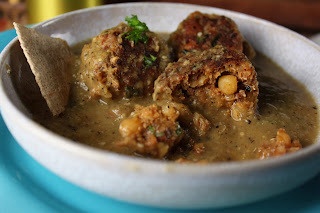 The simple tomatillo sauce takes these super veggieballs to the next level with a bursting roasted flavor. Here's the deal, if you really need meat, add it. Use a little ground turkey, ground hamburger or even chorizo. Dave needed meat so I added 4oz of chorizo to half of the dough for him. The key is you're still getting the nutrients from the quinoa and by cutting down the amount of meat used, it cuts out half of the fat. All good things. Remember, just because it looks like a meatball but isn't made with meat doesn't mean it isn't good- just different. And keep this super simple tomatillo sauce recipe, it could be a quick salsa or a sauce over rice and beans. 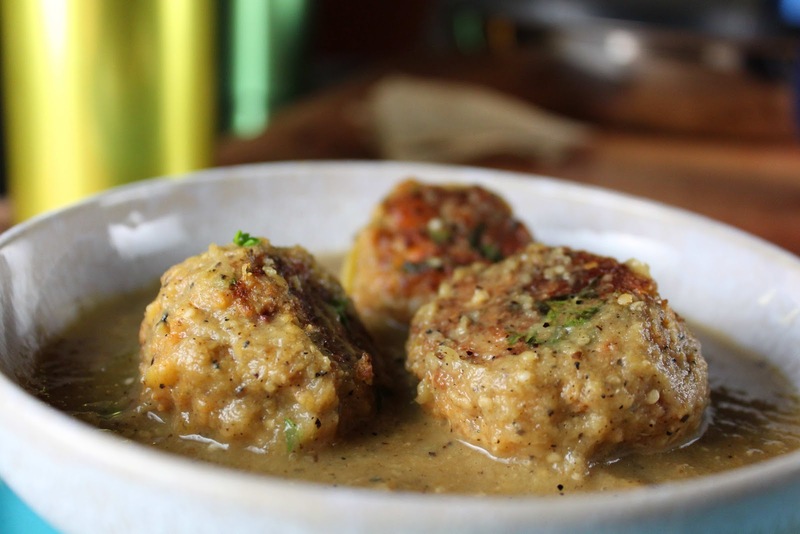 Transform you meatballs into something a little fat and happy today! Tips and techniques: This is a delicate mixture and rolling these balls takes a light hand, if you are having problems forming these into balls, simply form them into mini little patties instead. To peel the tomatillo's, do this under running water. It will make removing the outside paper easier and help to remove the stickiness that is left over after the paper is removed. Turn the broiler on your oven to high. Line a cookie sheet with tin foil or parchment paper. Peel the tomatillos and place them on the cookie sheet. Add the chopped onion and garlic cloves. Roast until all the veggies begin to turn to blacken. Remove the sheet from the oven and place in a blender with the green chili's, add the broth slowly until desired consistency is reached. Add salt to taste. Make the lentils according to the package directions, half way through the cooking add the quinoa so that they will both be complete at the same time. Add the cooked lentils and quinoa into a bowl, add all the remaining ingredients and mix well with your hands. Carefully roll small balls balls and set them aside. If you are having problems rolling the mixture into balls, just make small patties instead. Heat a fry pan with a little Pam or canola oil, cook the quinoa meatballs until golden on each side. 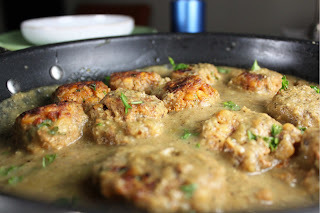 Add the tomatillo sauce to meatball pan, simmer to ensure everything is warm. Serve a couple of the veggieballs with a few spoons of the tomatillo sauce. I just thought you should know this has become one of our family's favorite meals. I've made it several times over the past two months and we love it. I've adapted it to use with Indian and Italian -style sauces as well. Thanks much for posting! Thanks so much for sharing! Love the idea of adapting both Indian and Italian- sounds delish!